Summary:It’s the end of the world. Six students have taken cover in Cortege High but shelter is little comfort when the dead outside won’t stop pounding on the doors. One bite is all it takes to kill a person and bring them back as a monstrous version of their former self. To Sloane Price, that doesn’t sound so bad. Six months ago, her world collapsed and since then, she’s failed to find a reason to keep going. Now seems like the perfect time to give up. As Sloane eagerly waits for the barricades to fall, she’s forced to witness the apocalypse through the eyes of five people who actually want to live. But as the days crawl by, the motivations for survival change in startling ways and soon the group’s fate is determined less and less by what’s happening outside and more and more by the unpredictable and violent bids for life—and death—inside. When everything is gone, what do you hold on to? My Thoughts: I'm not even sure where to begin this review or what to say exactly but I'll try. This Is Not A Test is unlike any Summers we have read before. Usually Summers writes contemporary books and this book was so not that! Think of the world coming to an abrupt end and zombies taking over! The protagonist, Sloane is a very ordinary yet unique girl. She lives with her sister Lily and her abusive father. Lily and Sloane had planned on running away, until Lily went without her. The book opens up with Sloane and her father at their house while chaos takes over outside. After days spent on the run, Sloane ends up with a group of other kids from her school and they end up at the school to take shelter. It's madness outside. 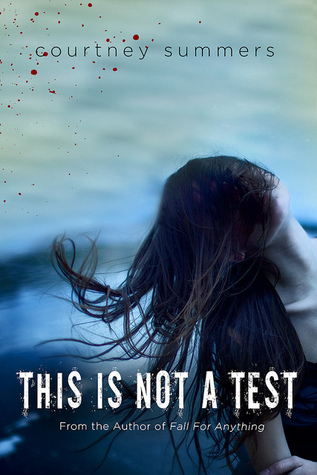 This Is Not A Test is split up into parts, detailing more and more as the story goes on. Days tick by, and the teens are debating on what to do. Do they stay in the school, or do they try to make it to one of the shelters? Yes, they have food and water but for how long? They are tired and scared. This novel goes beyond a reader's expectations regarding zombie novels because we actually get to experience firsthand what is happening. People die and things aren't always sunshine and flowers. I really liked getting inside all the character's heads. I felt like I got to know each and every one of them. They all had their own attributes and thoughts. My favorite was probably Sloane's, because I could see how hard things were for her and how she handled them. At times, she wanted to cave in and just let herself go. I usually don't really read zombie books, but this one was pretty good. Overall: I won't lie, this book is pretty graphic. There are some parts that make you really think and you can see the scene unraveling in your head. I really enjoyed This Is Not A Test. I still like Summer's contemps better but this is a nicely done fresh start for her outside her comfort zone. All in all, I really enjoyed this novel. This novel is somewhat weird, but in an interesting way. Cover: It's neat. It's kind of dark in a way but it's also kind of pretty. The blue in the background and the way her hair is falling is neat. Thanks for your thoughts. I really want to read this one. I think it sounds awesome...but I really like zombies, so it's kind of cool how this one contains them but in what seems to be a unique fashion. I'm so excited to read this one soon! I'm not a zombie book fan but I do like Courtney Summers' writing and I've enjoyed seeing the positive reviews for it.